The purpose of the current study was to test the feasibility of using the Patient-Reported Outcomes Measurement Information System (PROMIS®) measures to assess change in self-reported health status for dyads of individuals with advanced Parkinson's disease (PD) and their caregivers. Fifteen dyads (N = 30) participated and took 11 PROMIS measures. The measures showed good reliability (all Cronbach's alphas > 0.82). Dyads reported worse health status than the PROMIS reference groups at baseline and 6-month follow up. Paradoxically, individuals with PD scored higher in Applied Cognition–General Concerns, Companionship, and Emotional Support than the reference groups at both times. The only domain that changed significantly for individuals with PD over 6 months was Applied Cognition–General Concerns. The results of this study suggest that future research (a) could use the PROMIS measures with dyads, and (b) would be warranted for tracking changes over time using the PROMIS measures with larger samples, garnering more power. In addition, future research could examine if the computer adaptive versions work for individuals with advanced PD. Parkinson's disease (PD) is a progressive neurodegenerative disease with no cure. The characteristic PD motor symptoms include bradykinesia, tremor, rigidity, and postural instability. The number of motor symptoms increases in individuals with a longer duration of PD (Shin, Pohlig, & Habermann, 2017). The severity of PD motor symptoms has been traditionally described using a five-stage scale. PD symptoms affect an individual's functional ability in advanced stages (Stages 4 and 5). In Stage 4, individuals have limited walking ability and need caregiver support for activities of daily living (ADL). They become dependent on caregivers and are chair-bound or bed-ridden without assistance in Stage 5 (Hoehn & Yahr, 1967). In advanced stages, most individuals use assistive devices, such as canes, walkers, or wheelchairs, to enhance their mobility. Living at home impacts individuals with advanced PD and their caregivers in various ways. Individuals with advanced PD require caregivers' constant, extensive assistance in ADL and treatment regimens due to limited and unpredictable functional abilities (Haahr, Kirkevold, Hall, & Østergaard, 2011). These individuals also experience cognitive decline, psychosis, sleep problems, and depression. Frequent falls and aspirations secondary to dysphasia could increase caregiving burden and safety concerns (Abendroth, Lutz, & Young, 2012; Habermann & Shin, 2017). Although caregivers try to balance priorities and demands of life and caregiving, they often experience emotional and physical health problems, such as depression, sleep problems, and limited social activities (Haahr, Kirkevold, Hall, & Østergaard, 2013; Hasson et al., 2010; Martin, 2015). Research has studied individuals with advanced PD and their caregivers; however, there is little evidence about self-reported health changes in dyads of an individual with advanced PD and his/her spousal caregiver over time using the same measures. 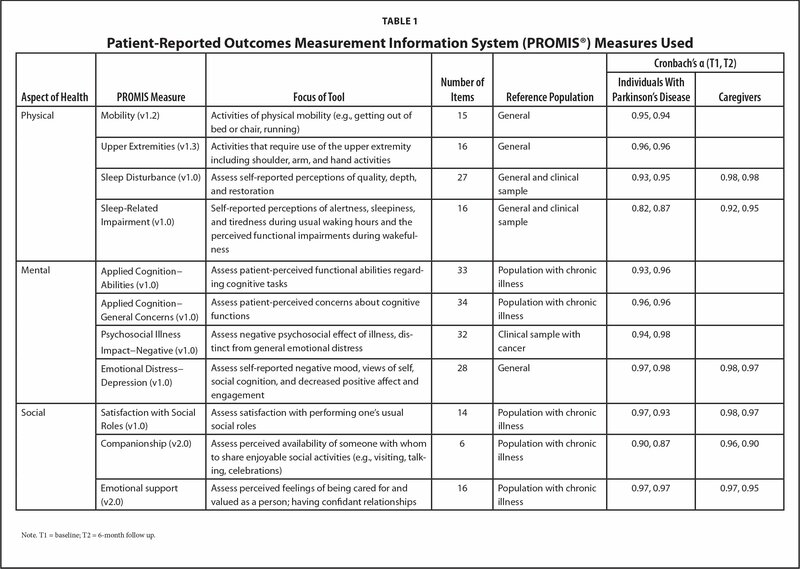 Using the same set of measures, such as the Patient-Reported Outcomes Measurement Information System (PROMIS®), could provide easier assessment and interpretation of dyads' health status in the community setting. Consequently, it could facilitate timely interventions, such as palliative care for individuals with advanced PD in their homes. The purpose of the current study was to test the feasibility of using the PROMIS measures to assess change in self-reported health status for dyads comprising individuals with advanced PD and their caregivers. The study was part of a mixed-methods study, which aimed to understand how PD symptoms progress and how dyads of individuals with advanced PD and their caregivers make decisions about health care over time. Potential participants were recruited from local support groups and PD clinics in the Mid-Atlantic area. Inclusion criteria of dyads were: (a) individuals with advanced PD who were unable to walk independently and used assistive devices for movement 100% of the time; (b) individuals with PD who had sufficient cognitive ability to participate in the study; (c) family caregivers who were typically a partner or spouse; and (d) dyads willing to participate in two data collection sessions 6 months apart. Individuals with Parkinson's-plus syndromes (i.e., disorders of multiple system degeneration) were excluded. Institutional Review Board approval was obtained from the authors' institution. After a dyad expressed interest in participating in the study, the individuals were screened for inclusion and exclusion criteria by phone. First, individuals with advanced PD were screened for cognitive impairment using a six-item telephone screen by a researcher (B.H.) (Callahan, Unverzagt, Hui, Perkins, & Hendrie, 2002). The six-item screen comprised the three-item recall (i.e., apple, table, penny) and three-item temporal orientation (i.e., day of the week, month, year) and was meant to exclude individuals who were moderately and severely cognitively impaired. After successful screening, the first home visit was scheduled, and all participants gave informed consent at the first visit. A researcher (B.H.) and research assistant visited participants' homes at baseline and 6-month follow up. Data were collected using paper questionnaires twice over 6 months between July 1, 2014, and October 20, 2015, to assess changes in health status. As this was a feasibility study, a relatively short follow up was used. All participants completed the questionnaires in one session, which ranged from 60 to 75 minutes in duration. Demographic and clinical data were collected by a self-reported paper survey developed by the authors. Items of demographic data included age, race, income level, years of education, current employment, retirement, disability, and number of years together. Items of the clinical data included self-reported other illness, PD medications and dosages, years of assistive device use, types of assistive devices used, and whether the participant with PD was home-, chair-, or bedbound. Selection of measures for comparing dyads' health status is somewhat challenging due to the variety of PD symptoms and different levels of functions among dyads. A targeted instrument such as the Neuro-QoL (Quality of Life in Neurological Disorders; developed identically to PROMIS) would not be appropriate for healthy individuals, as it was not designed or normed to assess healthy caregivers without neurological conditions or disorders (Gershon et al., 2012; National Institute of Neurological Disorders and Stroke, 2015). Although the PROMIS measures have been validated and used in subgroups of PD populations (Cella et al., 2010; Shulman et al., 2016), no research was identified using the PROMIS to measure the health status of dyads of individuals with advanced PD and/or their caregivers. The PROMIS is a set of person-centered measures that assess aspects of physical, mental, and social health. Overview of the PROMIS measures, their construction, and the advantage of using a tool that is scored using the Item Response Theory exists in the literature (Cella et al., 2010; Pilkonis et al., 2011; Riley et al., 2010). Another advantage of using the PROMIS is that it has been normed using national samples from the United States and specific subpopulations. Therefore, it can be given to individuals in the general population and those living with chronic conditions, specifically using the HealthMeasures Scoring Service (HealthMeasures, 2015). All PROMIS measures are reported using a common scoring metric; the domain scores of each measure are converted to a standardized T-score (Bevans, Ross, & Cella, 2014). A T-score of 50 on each PROMIS measure is the average score when using the U.S. population as a reference group. Eleven PROMIS measures were selected based on expert opinion of common PD symptoms assessing physical, mental, and social health in individuals with advanced PD (Table 1). Physical health was measured using four PROMIS measures: Mobility, Upper Extremities, Sleep Disturbance, and Sleep-Related Impairment, which are frequently reported in individuals with PD (Martinez-Martin et al., 2007; Stacy, 2011). Four measures of mental health were used: Applied Cognition–Abilities, Applied Cognition–General Concerns, Psychosocial Illness Impact–Negative, and Emotional Distress–Depression. Individuals with PD could develop dementia or cognitive conditions in the advanced stages (Bunting-Perry, 2006). Three measures of social health were used: Satisfaction with Participation in Social Roles, Companionship, and Emotional Support. Individuals with PD and their caregivers tend to decrease their social activities (Martin, 2015). Thus, these three measures were used to assess social health. Caregiver health status was measured by six of the 11 measures, including Sleep Disturbance, Sleep-Related Impairment, Emotional Distress–Depression, Satisfaction with Participation in Social Roles, Companionship, and Emotional Support. Caregivers did not complete the five measures related to PD-specific symptoms. A higher T-score indicates more of the domain being measured; as such, a higher T-score is not always “better.” Thus, interpretation of results should be based on the direction of wording of the items in the measure (HealthMeasures, 2015). For example, higher scores of Sleep Disturbance and Sleep-Related Impairment suggest a higher level of sleep disturbance and sleep impairment. Other examples in which high scores are perceived as worse are Applied Cognition–General Concerns, Psychosocial Illness Impact–Negative, and Emotional Distress–Depression. Data analyses were performed using SPSS version 24. Descriptive statistics were used to describe characteristics of the sample. Data assumptions were checked by examining box plots for outliers and assessing normality using the Kolmogorov–Smirnov test. Reliability of each PROMIS measure was evaluated using Cronbach's alpha. Non-parametric, Mann–Whitney U, and Wilcoxon Signed Ranks tests were used for examining change over time. Significance level was set at α = 0.05. Fifteen dyads participated in this pilot study (N = 30). 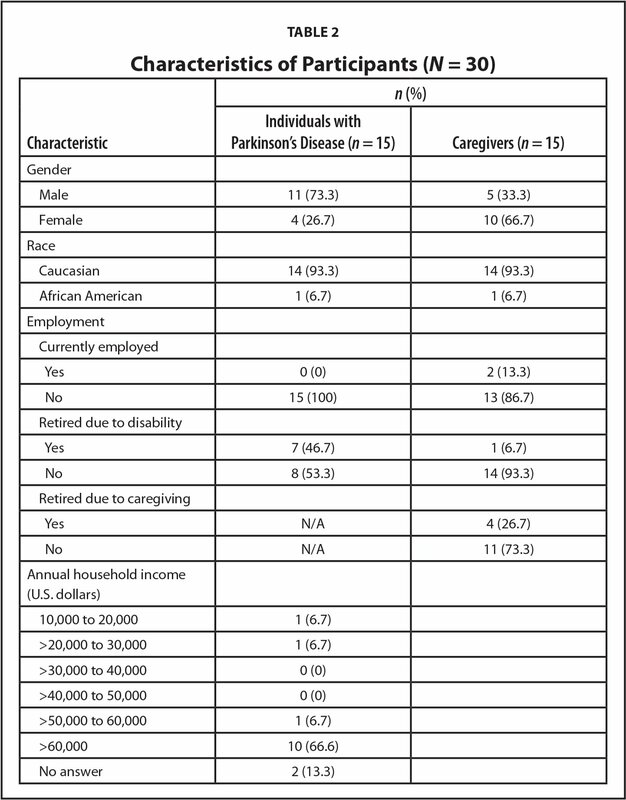 The mean age of individuals with PD was 75.3 years (SD = 9.81 years) and the mean age of caregivers was 68.9 years (SD = 11.99 years) (Z = −1.37, p = 0.171). A total of 73.3% (n = 11) of individuals with PD were men. Only one dyad was an African American couple; the remainder were Caucasian couples. The mean number of years of education of individuals with PD was 15.8 (SD = 3.32 years) and the mean for their caregivers was 15.2 years (SD = 2.59 years) (Z = −0.421, p = 0.674). The mean number of years of living together was 41.4 (SD = 15.47 years). The mean number of years of living with PD was 9.7 (SD = 4.59 years). The mean number of years of using assistive devices was 5.9 (SD = 4.54 years). All individuals used at least one assistive device (mean number of devices = 1.8, SD = 0.86 devices). Two individuals with PD were homebound and one individual was chairbound. The mean number of anti-Parkinsonian medications taken was 2.2 (SD = 1.15 medications) and the mean number of all medications taken was 3.9 (SD = 2.09 medications). Table 2 shows other characteristics of participants. The mean number of other chronic diseases in individuals with PD and their caregivers was 3.9 (SD = 1.77 other chronic diseases) and 1.8 (SD = 1.57 other chronic diseases), respectively. Most PROMIS measures used in the current study had excellent internal consistency (Cronbach's α ≥ 0.9) (Table 1). Sleep-Related Impairment and Companionship reported by individuals with PD showed good internal consistencies (0.9 > Cronbach's α ≥ 0.82). Of note is that some participants with PD did not answer all PROMIS measures at baseline and 6-month follow up. These participants were in their 80s, the oldest in the study, and using two or more mobility assistive devices, such as a cane, walker, or wheel chair. They were also chair- or homebound. An explanation for the incomplete PROMIS measures may be instrument burden for those with higher degrees of disability. However, caregivers answered all items. Individuals With PD. Individuals with advanced PD had averages slightly above the PROMIS reference population for three measures, Applied Cognition–General Concerns, Companionship, and Emotional Support, at baseline and 6-month follow up (Table 3). The mean T-scores of Mobility and Upper Extremities were approximately 2 standard deviations lower than the average PROMIS reference populations. The mean T-scores of Sleep Disturbance, Sleep-Related Impairment, Satisfaction with Social Roles, Psychosocial Illness Impact–Negative, and Emotional Distress–Depression were worse than the PROMIS reference populations. It should be noted that Sleep Disturbance and Sleep-Related Impairment's reference populations comprised the general population and a clinical sample. PROMIS reference populations of Applied Cognition Abilities and Satisfaction with Social Roles were individuals with chronic illness. Over 6 months, individuals with advanced PD reported changes in health status. There were declines in PROMIS scores: 60% (n = 9) of individuals with PD in Upper Extremities and 67% (n = 10) of individuals with PD in Satisfaction with Social Roles reported lower scores. Nine (60%) individuals with PD reported higher scores in Applied Cognition–Abilities at 6-month follow up. However, there were no statistically significant changes in 10 measures over 6 months except Applied Cognition–General Concerns (Table 3). Individuals with advanced PD reported fewer concerns about their cognitive function at 6-month follow up compared to baseline. Caregivers. The mean T-scores of the six PROMIS measures regarding caregivers' health status were worse than those of the PROMIS reference populations, although they were within 1 standard deviation. 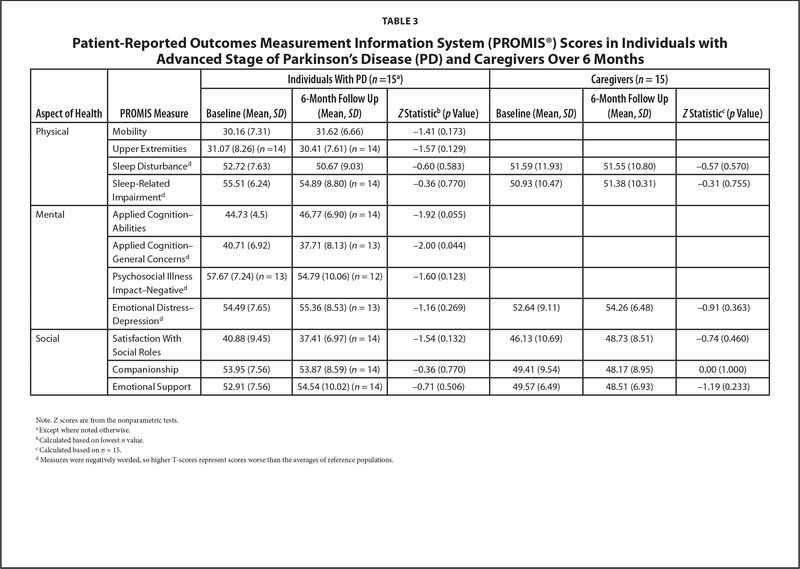 There were no significant changes in PROMIS scores of each measure over 6 months. However, 60% (n = 10) of caregivers reported a decline in Emotional Support. There were no statistically significant differences in these measures over 6 months. The purpose of the current study was to test the feasibility of using the PROMIS measures to assess change in self-reported health status for dyads comprising individuals with advanced PD and their caregivers. Although the PROMIS measures showed acceptable reliability in the current study, there are some points to consider for future studies. There could be several reasons why some participants did not complete all PROMIS measures. The level of functionality of participants needs to be considered when selecting the number of measures to assess health status of individuals with advanced PD. Some PROMIS measures used for participants with PD had a large number of items (e.g., the Psychosocial Illness Impact–Negative), which may have resulted in respondent burden. Paper format of the PROMIS measures could also be a source of respondent burden, due to participants' dexterity with pencils. The next step would be to test the feasibility of the short forms of the PROMIS using computerized adaptive testing (CAT). Thus, it has yet to be determined whether CAT will be feasible in advanced cases of PD. As the PROMIS measures were universal measures rather than PD-specific, other instruments used in this area could be compared to measure health status in individuals with advanced PD in future studies. Future studies are needed to test the benefits of using the PROMIS in dyads of individuals with PD and their healthy caregivers. Dyads in the current study showed poor health status in eight measures in comparison to the reference populations, which could be associated with their advanced PD and other chronic diseases. Lower scores on Mobility and Upper Extremities are most likely associated with advanced PD motor symptoms (Weintraub, Comella, & Horn, 2008). Participants also reported sleep disturbance and sleep-related impairment, which were frequently reported non-motor symptoms among individuals with PD (Shin et al., 2017). Higher levels of psychosocial illness impact and emotional distress in individuals with PD are consistent with findings in previous studies (Gallagher, Lees, & Schrag, 2010; Pfeiffer, 2016). Lower satisfaction with social roles could be related to limited social activities (Uebelacker, Epstein-Lubow, Lewis, Broughton, & Friedman, 2014). Levels of companionship and emotional support in individuals with advanced PD in the current study were better than those of the reference populations, which might be related to the care and support they received from their caregivers. Of note is that individuals with PD reported fewer concerns about their cognitive functions, although their self-reported cognitive abilities were worse than average. They also reported significantly fewer concerns at 6-month follow up compared to baseline. The reports might be associated with the fact that they did not recognize any concerns about their cognitive abilities or that they reported more desirable answers. Comparing self-reported cognition status with objective data on cognitive ability of individuals with advanced PD could ensure timely assessment and interventions for cognitive changes/impairment. Caregivers' health status was slightly worse than the PROMIS reference populations. There is a need for attention on caregivers' emotional health status, as 60% of caregivers reported a decrease in emotional support over 6 months. Considering their age, health conditions, and extensive caregiving activities at home, caregivers also need supportive care, such as respite care for their own health and well-being (Abendroth et al., 2012; Tan, Williams, & Morris, 2012). The current study has limitations. Due to the nature of the study, the sample size was not calculated by a power analysis. Findings are based on self-reported data measured by the selected PROMIS measures. Those PROMIS measures did not show many significant changes in dyads' health status over 6 months. Six months may not be long enough to measure any PD symptom progression and/or psychosocial aspects. However, discussion of the generalizability of findings is beyond the purpose of the current study. The current study showed the feasibility of PROMIS measures in dyads of individuals with advanced PD and their caregivers. The scores of the PROMIS measures showed findings consistent with previous studies, in which dyads' health status in several areas was worse than the PROMIS reference groups. However, limitations exist for assessing change in dyads' health status over 6 months. Based on the gained knowledge from this study, future studies are needed to test shorter, computer-adapted forms of PROMIS measures in a larger sample of populations with advanced PD. Weintraub, D., Comella, C.L. & Horn, S. (2008). Parkinson's disease—Part 1: Pathophysiology, symptoms, burden, diagnosis, and assessment. American Journal of Managed Care, 14(Suppl. 2), S40–S48. Dr. Shin is Associate Professor, and Dr. Habermann is Nannie Longfellow Professor, and Associate Dean, Translational Research, School of Nursing, and Dr. Pohlig is Senior Biostatistician, College of Health Sciences, University of Delaware, Newark, Delaware. The authors have disclosed no potential conflicts of interest, financial or otherwise. This study was supported by an internal fund from the University of Delaware College of Health Sciences awarded to Dr. Habermann. The authors wish to thank the participants, local Parkinson's disease support groups, and the Parkinson's & Movement Disorders Center of Maryland. Address correspondence to Ju Young Shin, PhD, APRN, ANP-C, Associate Professor, School of Nursing, College of Health Sciences, University of Delaware, 25 N. College Avenue, Newark, DE 19716; e-mail: jushin@udel.edu.